From the filming of Willie Nelson 60th birthday party. – Bob Dylan (vocal and guitar), John Jackson (guitar), Tony Garnier (bass), Bucky Baxter (accordion) & Marty Stuart (mandolin). Reggie Young (guitar), Mark Goldenberg (guitar), Robbie Turner (pedal steel guitar), Marty Stuart (mandolin), Mickey Raphael (accordion), Benmont Tench (keyboards), Mark O’Connor (violin), Don Was (bass) & Kenny Aronoff (drums). 2-3 released on the VHS: Willie Nelson The Big Six-O: An All-Star Birthday Celebration, Fox Video 5934, released 2 February 1994.
pegged , as many of us know Willie can pick up any song ( if he likes it) and give it his own lyrics and tune , & with that nightingale pitch blend in with any singer’s voice. 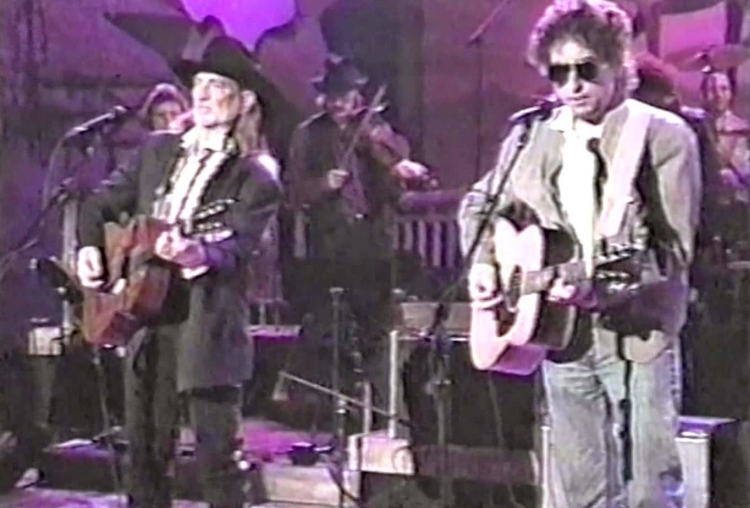 The beauty of Bob Dylan & Willie on the song they sang is how much they are alike ( unique voice wise ) , great writing , humble , and their own men .